Here’s an exclusive look at the new Identiti Persona frameset. I have to say, for the pricepoint, this is another contender for a good beginner’s bike. 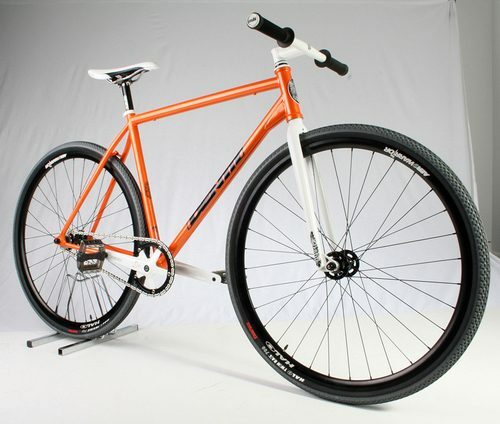 It comes in orange and gray as a complete or as a frameset. I like the thumbprint headbadge and decal. The Persona’s final specs for the full build is still to be determined, but it will include Halo wheels and the FFX fork. Full specs and price below. We are stoked to announce that we have just finished the R&D on our new Fixed Gear Freestyle frame (the Persona) and we are now satisfied that it is exactly what we envisaged. BMX/MTB influenced lightweight and strong frame for the Fixed Gear Freestyle fraternity. Identiti are already trusted the World over in the 4X and Jump bike markets and have the knowledge and ability to produce performance hardtail frames and forks for this evolving market sector. Most frames currently available for Fixie use were designed as “Road” products, and will struggle to handle harder use, so we’ve used some of the stuff we’ve learnt over the years to provide a strong but not excessively heavy frame that can handle today’s progressive riding. We’ve tweaked the classic fixie frame geometry to provide a little more space up front for bar spins etc, and a sloping top tube…to allow more room and maneuverability. A downtube box gusset adds additional strength where it is needed most. The Persona also features unique Taper-Lock CNC dropouts keep your chain tight without the need for chain tugs and is in keeping with the frames’ minimalist clean looks. With the Taperlock system, your wheel can never pull forwards under pedal torque. Double butted TAF Cr-Moly tubing throughout. Oval and tapered 410mm chainstays. Taper-Lock CNC dropouts (no tugs required). Open tail box downtube gusset. Integrated headset (Campy type) included. Weight : 2,305g (5.1 lbs). Matte Black, Metallic Orange or Chrome Plate. 3 sizes: Small 49.4cm, Medium 51.4cm, Large 53.4cm. Price around £275.00 including headset and seat clamp. The Persona will also be available as a complete bike – full spec tba but they will definitely come with the superb Identiti FFX forks and Halo wheels. The attached images of the built up sample bike are pretty close to what will be the final specs.